Fed up with how long it takes to find good content? 1. Fill your Queue by importing your past blog posts. Simply enter your blog URL, and import one or all of your recent posts. You can also import posts from your favourite blogs. They will automatically be added to your Queue with the featured image attached – making sure your posts get noticed – no extra effort required! 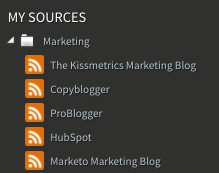 2: You can bookmark your favourite blog sources, making it effortless to check them for fresh content in the future. If you’re used to working with spreadsheets to plan your posts, you can still import them into SmarterQueue. It’s also a great way to bulk import content that isn’t already online. Bonus: Download our browser extension which lets you fill your queue as you browse the web. Click it to create a post from the page you’re reading – we’ll even prepare the images for you. Download our browser extension here. One reason only: to save you time. Find great content in seconds.